Plants with branches spreading or sprawling, 2-7(-15) m. Stems: bark gray, peeling off in small white, gray, or brown flakes, inner bark light brown; twigs green and puberulent when young, gray at maturity, glabrous or pubescent. 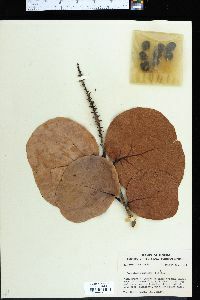 Leaves: those of adventitious or juvenile shoots often much larger and of different shape from those of normal shoots; ocrea persistent proximally, deciduous distally, brown or reddish brown, cylindric to funnelform, 3-8 mm, coriaceous proximally, membranous distally, margins oblique, glabrous or densely puberulent; petiole 5-15 mm, puberulent to pilose; blade pale green abaxially, green to bluish green adaxially, round to transversely elliptic, (6-)10-20(-27) × 6-20(-27) cm, length equaling or less than width, coriaceous, base cordate, margins sometimes revolute, apex rounded to blunt or emarginate, abaxial surface dull, adaxial surface shiny or dull, minutely punctate, glabrous. Inflorescences 10-30 cm, puberulent or glabrous, pistillate pendent in fruit; peduncle 1-5 cm, glabrous. Pedicels 1-4 mm, glabrous. Flowers: tepals round to broadly elliptic, margins entire, apex obtuse. Staminate flowers 1-7 per ocreate fascicle. Pistillate flowers: tube obpyriform, 12-20 × 8-12 mm, becoming fleshy. Achenes 8-11 × 8-10 mm, shiny. 2n = 132. Flowering year-round. Sandy or rocky coastal hummocks, sand dunes. 0-10 m; Fla.; Mexico; West Indies; Central America; South America. Coccoloba uvifera is an early colonizer of exposed, sandy shorelines. The wood has a specific gravity of 0.7, and a red sap obtained by cutting the bark has been used in commerce for tanning and dyeing (E. L. Little Jr. et al. 1969). Pistillate inflorescences of some specimens of Coccoloba uvifera appear to bear clusters of up to five flowers at each node; all but one abort, leaving a single flower that produces a fruit. The pedicels of the abortive flowers usually are more slender than those of the fertile flowers.